Analysis of the scientific state in the field of foundry has been performed. 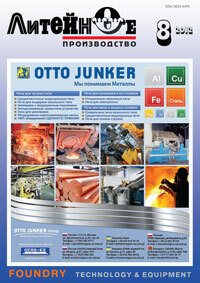 Prospects and problems of using Al alloys in the car making industry have been shown by the example of OAO "AVTOVAZ". A concept of switching the aluminium casting production to the 6thtechnological platform until 2020, including five global projects, has been proposed. Key words: concept, aluminium alloys, car making, projects, innovations, modernization, casting quality. Dependence of complete hardenability of castings on their thickness, and silicon and chromium contents in nodular chromium-nickel iron is shown. Key words: hardenability, chromium-nickel iron, plate thickness, nodular graphite, hardness, silicon. The work presents the data to determine the effect of gas content in the basic electrochemical properties of the standard aluminum protector alloy and estimates of maximum permissible amount of gas for various brands of standard aluminum protector alloys. Key words: aluminium protector alloys, gas porosity, hydrogen solubility, corrosion and electrochemical properties. The chemical composition and microstructure of low-alloy heat-resistant cast iron for parts exposed to complex thermo-mechanical conditions, such as glass moulds, are presented. It's found that D-type graphite structure and small amounts of Ti, Mo, Ni, V and Cu provide high durability of glass moulds. Key words: cast iron, microstructure, alloying, glass mould, thermal conductivity, rate of solidification. The article is dedicated to the use of computer-aided simulation of the hydrodynamic task of casting processes (pouring), the so-called "SPH" method. Such an approach allows to more adequately consider the hydrodynamic processes in pouring, significantly accelerate the calculation process, and eliminate the necessity of building a calculation grid in the casting space beforehand. The method сurrently it seems to be the most promising method of solving problems related to the necessity of considering the so-called "free surface" in solving hydrodynamic tasks. Key words: casting process simulation, computer-aided system of casting process simulation "PolygonSoft", hydrodynamics, pouring, "SPH" method, gridless smoothed particles method. Diagnosis of causes of origination of gas-related defects in carbon steel castings has been performed. Negative factors influencing the origination of gas-related defects when using a release agent have been considered in detail. Causes of formation of gas-related defects in castings, and measures to eliminate them have been determined. Key words: steel castings, molding sand, release agent, carbon content, gas evolution, gasrelated defects. Analyses of environment variations may provide valuable insight the sources of casting defects. This paper demonstrates the application of statistical analysis to production of quality castings due to additional handling accumulated technological information. Key words: clay-bonded molding sand, rejects, gas permeability, plant standard. Explored action nanodispersed hydrosols, termoaktive clay and sandy on the process an precipitate particles of clay in the water ambience, as well as structurization modified nanosol an sandi-cley to compositions when shaping a material in process of drying. On changing an incrementation, fluidity dependency of modifying an sandy cley to compositions from the type an nanosol. Key words: nanodispersed particles, hydrosol oxides aluminum and organocserogel aluminum, water suspensions clays, glass and sandy, structures by ash and precipitation. Paramonov A.M., Dyachkov V.N. The Main Development Stages of Metallurgical and Casting Production at OOO PKF "Vershina"
Beilis L.M. Casting Technologies of Iron Foundry OOO "SamLit"